Garmin is clearly known as the top of the line GPS watches, as it is not enough, the company tries to offer another line of wearables with its popular activity trackers, including Garmin Vivofit and the Vivosmart. If these similar given-names are getting confusing in your search for the right tracker in the future, we will help you find the differences. We do compared the Garmin Vivofit to its more advanced competitor, the Garmin Vivosmart. 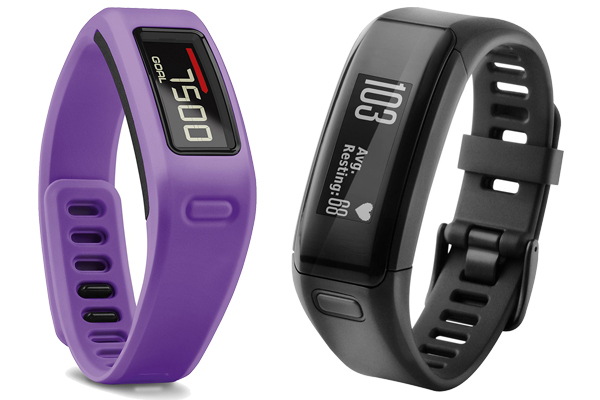 Read on Garmin Vivofit vs Vivosmart to see which one that may be the right wearable for you. Garmin Vivofit Fitness bands and one extra band with a color with different size, Ant + USB stick, and also card instructions. As a fitness device, using Vivotif, users can count steps, distance, and calories burned, as well as monitoring the user’s sleep time at night. To be used for 24 hours in a year, Garmin would likewise loaded with Vivotif features power saving. More than that, it turns out that Vivofit can give recommendations to users the appropriate fitness activities for based on gender, age, height and gradually be able to adjust the desired results. Users can also connect to the Garmin Connect, which is a social networking website based sports cloud from Garmin. In addition, this bracelet can also remind you when it’s time to move. So, Garmin Vivofit will alert you with the red color indicator when you do not have activity or movements for 1 hour. You can eliminate these indicators in a manner walk for a few minutes. Another plus is so tantalizing, bracelet Vivofit can last up to one year without replacing the batteries. In fact, you can use Vivofit while showering or when rain falls because of this bracelet. Garmin Vivosmart HR Vs Fitbit Blaze’s discussion can be your another reference if you need this. Garmin Vivosmart doing things typical features healthy tracker, ranging from display monitors steps taken, calories burned and blood pressure. And for those who want to acquire more accurate data and complete, Garmin Vivosmart Garmin products work with other heart rate monitors or bike speed sensor, but of course such devices sold separately. In addition to showing the time, smartband can also in-pairing with a smartphone (paired via Bluetooth) and encourage the realtime notifications directly to the device. Garmin Vivosmart color variant comes in Berry, blue and black, comes with a curved band design and OLED screen that is only turned on when a notice of entry. Although the battery life promised was able to one-year standby, but for intensive usage and utilization of all the features, the battery in a Garmin Vivosmart able to last up to seven days. For operational features, users can swipe various pages via the touch screen. Whereas to enable the screen, simply tapping (tapping) display 2 times. In the end of Garmin Vivofit vs Vivosmart, we would prefer to choose Garmin Vivosmart for its touchscreen display and deeper mobile integration. Beside of that, it is also a good improvement better than the Garmin Vivofit which is an older product. We know that it will have an extra price for among $30, but since it is totally worth it especially when you want to use any of the features offered on the articles. Just in certain case, if you are looking for a tracker that has a heart rate monitor and GPS built in, take a look at the Vivoactive HR, Garmin’s pricier tracker.